A large tanker repairs in dry dock. Shipyard Gdansk, Poland. When any shipping company looks to increase their fleet with new vessels, the process incurs not only long term operational and strategic commitment, but full quality control and support throughout the undertaking, from start to finish. With four tankers being built, one ship owner looked to V.Group for help. The entire shipbuilding process can be a lengthy and costly one. 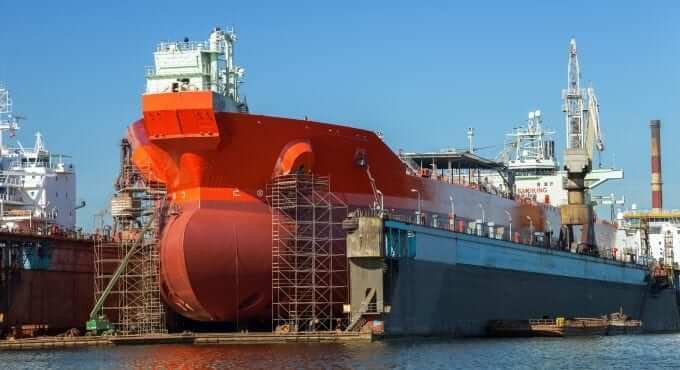 Many new ship builds are outsourced to shipyards all around world, and while that keeps project costs down, it can be a major drawback when it comes to project management. Our customer commissioned four 113,000 DWT, Large Range 2 product tankers, each of which were being built by two different shipyards in eastern China. As part of V.Group technical services, SeaTec were drafted in to give experienced new build supervision and project management for the whole process, from pre-contract support and plan approval, through to delivery and guarantee support. As part of the initial process, we provided a highly experienced, multidisciplinary team to complete a Specification & Contract Review. The team are highly knowledgeable in this area and consist of Naval Architects, Mechanical Engineers, Electrical Engineers, Coating Engineers, Superintendents and Captain to ensure every detail is covered. We also arranged for an expert technical negotiation team of Project Manager, Naval Architect, Mechanical Engineer and Electrical Engineer to help the ship owner with all technical specification negotiation with shipyards. As the project moved forward, the same multidisciplinary team oversaw plan approval. With a design background, their collective input is essential in ensuring any plans are structurally sound and fully compliant before construction begins. Once the building process was underway in the shipyards, we provided carefully chosen onsite supervision teams. Made up of a crew of specialists and a dedicated Project Manager, each has the technical, commercial and operational experience to oversee each project until completion, while keeping constant contact with the ship owner. With SeaTec providing the most flexible of resources for these new build projects, it was a success story for V.Group as all four vessels projects were completed on time and delivered to the ship owner successfully. All four vessels are now in good operation having been built to the highest of V.Group standards and passing quality control at every stage. Find all our latest news articles and press releases relating to V.Group and all our brands. For further media and press enquiries, please contact our communications department on: press@vgrouplimited.com.